Serving Southern Nevada since 1979, Cal Air Cooling & Heating is proud to offer you the best in residential and commercial HVAC services. Our company has over 35 years of experience in the HVAC industry and continues to provide home and business owners with top services for heating and cooling systems. From repair to installation and maintenance, we can offer you the right services for your comfort needs. Read on to see just what we can provide for you! We provide installation service so that you can have a new system in your home, with quality energy efficiency and performance. When you are building a new home or you are in need of a replacement unit, we offer the service with top-rated Carrier products. As a certified Carrier dealer, we offer only high performance products with top energy efficiency ratings so that you can worry less about your unit and enjoy the comfort the system can provide. Let our team of professionals show you what products we provide so that you can have a comfortable home no matter what the season. 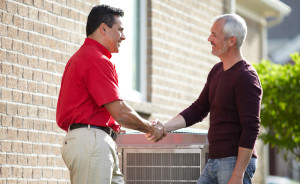 At Cal Air, we understand just how important your heating and cooling system is. With your existing unit, you will need to keep the unit operating in tip-top shape. Our technicians will provide you with excellent inspection and cleaning services so that your unit will continue to operate at maximum comfort and efficiency. With this service, you will find that your heating unit and air conditioning system will be ready to operate during the most extreme seasons of the year. With our quality maintenance service, you will feel good in your home as well as have the peace of mind knowing your unit is providing a safe and comfortable environment for the ones you love. Just as important as maintenance service is repairs. With your existing unit, you want to be sure that you take care of any repair service or inconsistencies that you may find with your unit. When your system breaks down, you need to have a proper technician provide you with top quality repair service. Our team of technicians will arrive quickly and inspect your unit – every component. With this inspection, the technician will be able to determine what the problem is and then make the appropriate repairs to the unit. With our reliable repair service, you will be 100% satisfied with the quality and performance of your heating and cooling unit. Your overall comfort is important to us. We want to provide you with the essential service you need for the cold winter months and the blazing hot summers. We can help you with all your comfort needs with our quality repair, maintenance and installation services. To find out more on what we can provide you, contact our office today. We can help you schedule an appointment for service or help you learn more about the premium service we provide.